Ever walked into an eatery and thought, I want my apartment to look like this? Yep, us too. Thanks to social media, restaurants are putting more and more thought into design, using unique color schemes, standout walls and handcrafted dinnerware to create the dreamiest of spaces. Here are some of our current decor-winning restaurants and how to incorporate the looks at home. 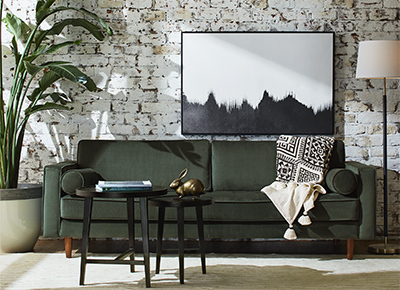 It's time to take your apartment one step closer to Instagram-worthy #homegoals. The Soho café-market is rustic and French in all the right ways, with purposely worn, mismatched furniture and servingware. Consider this a statement accessory for your kitchen—the mini size is also more realistic for city dwellers. Scatter these simple bud vases across the apartment with some eucalyptus from Trader Joe’s—greenery is an incredibly easy and affordable way to spruce up a space. Take your hosting game to the next level with a serving platter that’s way chicer than an aluminum pan. Nestled underneath the Williamsburg Bridge, this daytime café is a sunny, stylish respite with pastries from a Michelin-starred chef. Vintage-inspired letterboards aren’t just good for menus—use them to leave messages for roommates or as a landing place for inspirational quotes. The truest sign of adulthood is the moment you swap Ikea dinnerware for handcrafted ceramics. These are even a close match for Butler’s always-Instagrammed pastel blue plates. Modern meets industrial in this illuminating way to tie a space together. Plenty of green accents—plus some millennial pink—at this tropical-themed café coordinate with its signature drink. Add island flair without going full-on tiki with a set of pink and green wall art. Yes, it’s possible to decorate with neon in a way that doesn’t scream dive bar. Pops of color and unique prints add to the breezy feel of this Italian cantina, which specializes in housemade pastas and spritz cocktails. A peppy shade adds a cheerful burst to any dining area. No space (or budget) for a full-sized marble dining table? This elegant platter is the next best thing. Most of us probably don’t have an entire bar to deck out, but the stunning tiles could give a much-needed dose of charm to the tiniest of kitchens. The laid-back hangout—serving modern Southern fare and cocktails—is a plant lover’s dream come true, decked out with lush greenery from floor to ceiling. Transform sitting planters and terrariums into dangling room decor with this hand-twisted rope hanger. These reusable and—more importantly—removable decals help create an accent wall without fear of losing your security deposit. A printed area rug instantly adds warmth to an industrial space (or covers a less-than-gleaming hardwood floor).